Valentyn Oleksandrovych Nalyvaichenko, the post-EuroMaidan head of the Security Service of Ukraine (SSU/SBU) and an Orangist that left Viktor Yushchenko to join Vitali Klitschko in 2012, claimed that the attack MH17 was a Russian-linked false flag that went wrong. Interfax Information Service Group’s branch in Ukraine reported on August 9, 2014 that the SSU/SBU chief claimed that the Donetsk People’s Republic was planning on bombing a Russian airliner from Aeroflot that was supposed to fly south to the Mediterranean Sea from Moscow to the Greek Cypriot city of Larnaca. The SSU/SBU released an official statement on August 7, 2014 claiming that the plan was to give the Russian Federation a pretext for invading and occupying Ukraine. When Washington was challenged for proof about Russian involvement and the source of the attack on MH17, in the tradition of US Secretary of State Colin Powel’s weapons of mass destruction (WMDs) in Iraq presentation at the United Nations the US government presented doctored evidence which was debunked immediately. The US government released doctored satellite images that from an examination of the location of physical objects and atmospheric conditions were clearly taken days after MH17 was shot down. After embarrassingly being exposed for presenting false evidence to support its claims, Washington refused to provide anymore of its so-called evidence under the justification of not revealing data sources. In reality, Washington was lying again and had no evidence to support the ridiculous claims that Moscow had masterminded the downing of MH17. Not long after this, US officials admitted that they had no tangible evidence against Russia. Then they and their NATO allies began to look like they were losing interest in even investigation the MH17 crash in Donetsk. Within moments before the MH17 crash, a Spaniard employee working as an air traffic controller at Ukraine’s largest airport, Borispol (Boryspil) International Airport (not to be confused with Kiev International Airport in Zhulyany, southwest Kiev), using his Twitter account (Carlos @spainbuca),refuted the claims of the Ukrainian puppet authorities in Kiev and their backers in Washington. Carlos would write at 11:48 am on July 17, 2014 that MH17 was «escorted by 2 fighters of Ukraine until minutes before disappearing from the radar» screen at the air traffic control tower. What Carlos meant by fighters was Ukrainian fighter jets. Carlos also wrote, at 1:29 pm, that the Interior Ministry of Ukraine, which is heavily politicized and under the control of the ultra-nationalist forces behind the EuroMaidan coup, knew what the Ukrainian fighter jets were doing next to MH17 whereas the Ukrainian military knew very little and, at 1:36 pm, that the Ukrainian military confirmed that Kiev had downed the Malaysian passenger jet (please see the annex for what was exactly written). It would only be at 3:17 pm that the air traffic control tower would be told officially that a missile had shot MH17 down over Donetsk. Carlos wrote at 4:06 pm that Ukrainian military air control officials had said that the missile was one of their own. Because of his revelations, eventually the Spaniard’s Twitter account was blocked and deleted. 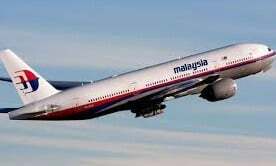 As soon as photographs of the crash became available, it was noticed by many people that it looked like the Malaysian jet has been fired on (in addition to any possible missile penetration). Specifically, the MH17’s cockpit looks like it was fired at from both sides, with both entry and exit bullet holes. This means that the MH17 was either shot at from two different angels or that the ammunition that was fired on it ricocheted outwards. Taken that the ammunition of the Ukrainian Sukhoi SU-25 is cannon ammunition is armour-piercing and made to destroy heavy armoured military vehicles, this makes a lot of sense. Despite the reasoning behind any possible blocking of articles and posts about MH17, the rationale given does not explain why Carlos was censored or why Twitter deleted his account (Carlos @spainbuca). The Spaniard would also do an interview with RT en Español (RT Spanish) or RT Actualidad from Madrid on May 8, 2014. Hiding his identity because of death threats he had received in Ukraine, the Spanish air traffic controller would explain that he and his family were deported from Ukraine to Spain by the puppet authorities in Kiev. The terrorist bombing of CU455 would be a national tragedy for all Cuban society. After winning gold medals for their country, Cuba, at the 1976 Central American and Caribbean Championships, all twenty-four members of the entire Cuban national junior fencing team would be killed in CU455. Most of the Cuban fencers were teenagers. The other passengers were Cuban fishing and sports officials and Guyanese medical students going to Cuba to study medicine. Minutes before reporting about the Ukrainian military’s involvement, at 11:13 am on July 17, 2014, Carlos wrote on Twitter that he was wondering why foreign personnel entered his air traffic control tower with Kiev authorities to gather information. The Spaniard later reported at 12:00 pm, interestingly minutes after the military authorities in Kiev had notified his air traffic control tower that MH17 was downed over Donetsk, that the air traffic control tower was filled with foreign personnel. Who were these foreign personnel? Most probably they were from NATO countries and, more specifically, from the US. There is no question that the US had a role in the downing of MH17; at the very minimum Washington has knowingly and criminally worked to distort the picture of what happened to MH17. It is also important to note that Carlos described divisions among the Ukrainian soldiers in Kiev through what appeared to be upset and disgusted faces by those soldiers who reported that Kiev was responsible for the downing of MH17 whereas the Ukrainian military personnel and authorities accompanied by foreigners were busy lying and trying to spin the attack on MH17. The downing of MH17 is not the crime of Ukraine, but an act committed by US and EU proxies, embezzlers, and fanatics. 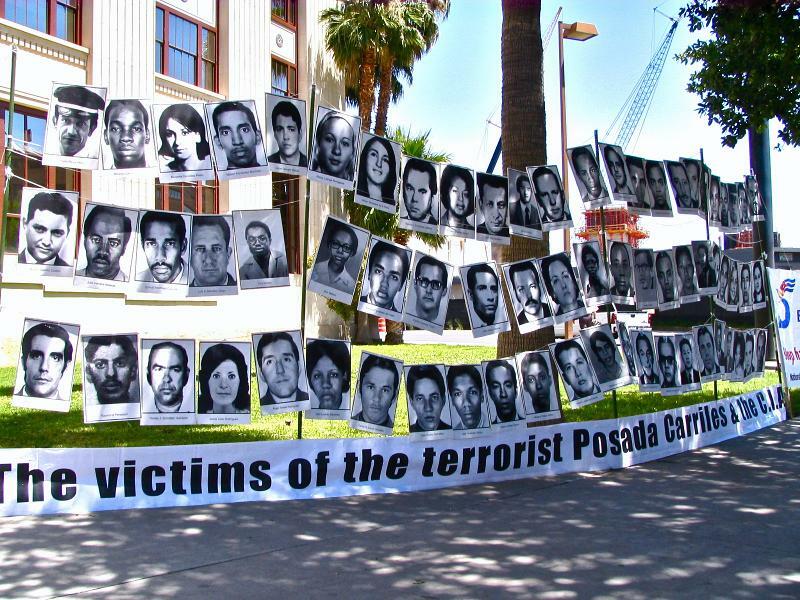 Commemorative photos of the victims of the terrorist attack on CU455; notice the CIA is mentioned in the banner. A photo of the victims of the US downing of IR655; a large portion of the victims were children.